Handy Backup provides a tool for backing up databases from Sybase DBMS, a standalone part of a popular SAP business automation software. For Sybase backup, Handy Backup provides many advantages, such as offline and cloud backup, differential backup and scheduling. Handy Backup uses a generic “Database” instrument for backing up Sybase IQ or other SQL-based Sybase solutions. This tool allows applying some features for efficient, quick and reliable SAP Sybase backup. If you want to open, to copy or to clone your Sybase backups without a restoration, you can just work with its elements located the backup folder. Handy Backup preserves these files in original formats, allowing using the data backed up directly from saves. 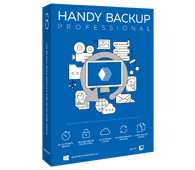 Handy Backup allows full, incremental, differential and mixed (full/differential) types of backup, to maximize the efficiency and to minimize the total cost of owning. It can also store versioned backups, as well as mark backup folders with clearly readable timestamps. When Sybase backup server data, the information must be saved to one or, preferably, several different locations and storages. 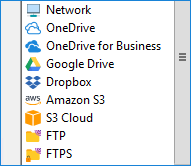 Handy Backup allows storing Sybase backups to local drives, USB and NAS disk units, cloud services such as Amazon S3, a dedicated cloud HBDrive, FTP/SFTP/FTPS and more. Small hardware requirements, allowing backup without running out of a server memory. An ideal solution for SAP Sybase workstations, the Professional edition already contains a Database tool for making Sybase backups. Free 30-days trial version! How to Make a Sybase Backup with Handy Backup? Let us tell you about using a Sybase backup through a small “how-to” guide. Please mention that the two first actions of this guide are not linked to Handy Backup; these are the system operations guided through Windows. Firstly, please obtain an ODBC driver for your particular Sybase product. Handy Backup will work with any version and solution of Sybase, and an ODBC driver is a single principal requirement for this job. Additionally, capabilities of an ODBC driver will define the possibility of a “hot” Sybase backup. To add your ODBC driver into a list of data sources, please open a Control Panel of your Windows and select the option called “Data Sources (ODBC)”. Then add your installed ODBC driver into a list. After this operation successfully completes, Handy Backup will “see” your Sybase data. Note: The two steps described before are not parts of Handy Backup software and cannot be governed by the functions of Handy Backup, anyway. Open Handy Backup. 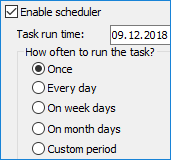 Press Ctrl+N or click on a new task button to call for a new task wizard. Select a backup task type. Proceed to a Step 2, and then double-click on the “Database” feature. Double-click on a string with Sybase databases in a data list on the right panel. 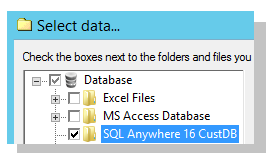 Select a database you want to back up in a drop-down list, and then click OK to proceed. Continue selecting other task parameters step-by-step, as described in the User Manual. You can obtain a personal experience about all functions of the Sybase backup by downloading and installing a full version of Handy Backup on a 30-days free trial period.